Hi everybody! Today is the first step in refining the core gameplay experience of Shoppe Keep 2. We are working very hard to improve the game and have had some tremendous feedback from players. We still have quite a journey to improve Shoppe Keep 2 during Early Access and we hope that you all enjoy the improvements! We discovered that many new players were finding it difficult to progress within the game - some even not understanding that there were more than the initial base items to sell in the game, and struggled to open the gates of the town. We wanted to help new players understand how to progress within the game and have changed how players unlock new buildings and crafters. Pad Tax will still accumulate and is used to unlock upgrades. For example, the cook requires you to pay 250 tax, the blacksmith requires 750 tax and so on. 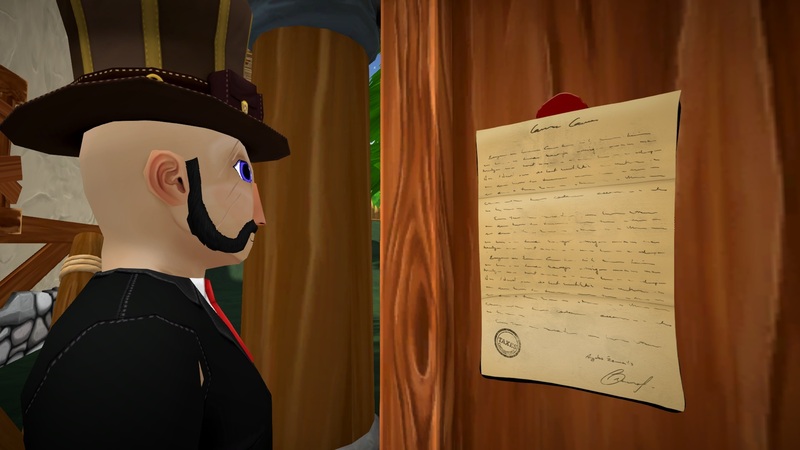 We hope this will give more meaning to the world and allow players to understand what they are working towards and what they can do once they unlock this new building. Once they unlock one item with tax, they will then receive information on the next available unlock. All this information can be found in the new Day Summary report which generates at midnight every day. The Day Summary report puts a little more context to your activities within the shoppe. We wanted to give players the opportunity to think about what they had sold, and how they can improve. The report includes helpful data such as the total items you've sold, how much money was made from each type of item, your tax threshold and the ability to pay tax directly without needing to speak to Gil the accountant. To access the end of day report when you see the small icon at the end of a day, visit the notice board by the management house. Let us know what you think of the new daily report! Additionally, we've made some subtle changes to how customers voice their opinion of your shoppe. If a customer experiences something positive happen in the shoppe like finding a good price on an item they want, they will emit a green happy face! What is the outcome of keeping your customers happy? It will affect the customers' feeling towards your shoppe. You will see your hate level underneath the hot bar. You want to keep this hate level low otherwise customers will start to attack your shoppe! Added within this build is a brand new appeal gauge. 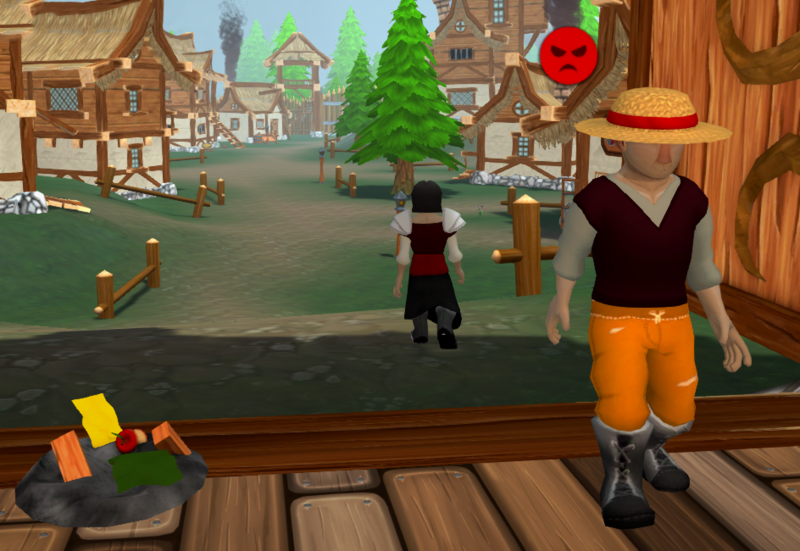 Initially this figure was accessible within the town management window, but we moved it to the top of the UI so that the player can see how their shoppe is performing at all times. Good shoppe appeal will increase the number of customers that visit your shoppe and can be affected by having a variety of item types on display and an assortment of different furniture pieces. Customer AI has been improved and they are more likely to buy items from your shoppe. 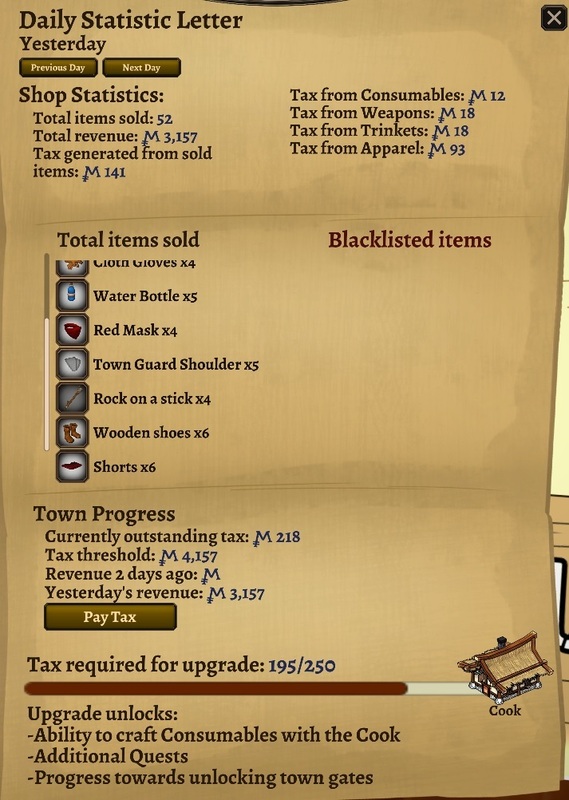 Day summary displays the last 7 days' sold items, how much those items generated in revenue, tax, which items are blacklisted currently, as well as your total owed tax/tax threshold and how many tax strikes you currently have. Day summary window displays your current progress towards the closest town upgrade as well as what this upgrade unlocks. You are given an option to pay all taxes at once, and you will see how much further you will progress if the tax is paid in full. Customers show their shoppe experience with smiley or angry faces over their head depending on what action occurs around them. Some NPCs receive an info button in their UI, which allows you to read up about them by pressing the button. I can’t find the Tavern. I had enough taxes to get it, but I have no idea where it is.